What is it that goes bump in the night? Ever since man could walk and tell stories, he tried to explain a scary, dangerous world. Fear of the unknown is a powerful motivator; man has never tolerated what was not understood. From the oldest cave paintings in France to the most determined scientist today, man is forever driven to abolish this fear of the unknown. In the Book of the Day and the Book of the Night, the ancient Egyptian Goddess Nut arched protectively over the Earth, eating the sun at night and given birth to it in the morning. This explained how the sun rose and set each day. In Greece it was Apollo, his flaming chariot racing across the heavens to do battle in Hades at night. How each culture explained its world differed, but almost all of them had some form of deity, from a god to a great spirit, to help explain what at the time was unexplainable. It was not until much later when Galileo determined that the Earth revolved around the sun that man now had the science to explain why the sun rose and set the way it did. Until then, there was fear in the night, and only the help of the gods could bring forth the light for another day. It was not just the rising and setting of the sun that man did not have the science to understand. There was Cyclops, Thunderbird, Madame Pele, even Noah and his mighty flood, and many many others. Any great natural event, especially geologic events that man can witness firsthand and up close, have been explained one way or another. One such story is the Bridge of the Gods of Klickitat origin of the Plateau region of the interior Pacific Northwest. 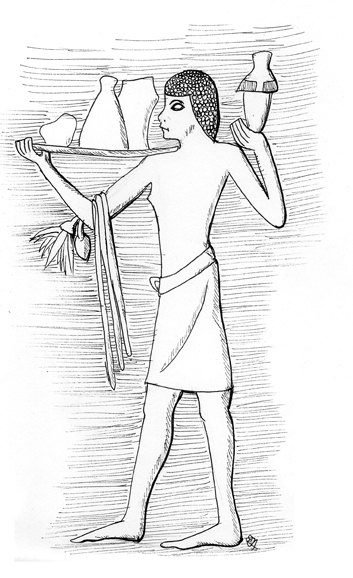 The image above is one of a procession of bearers bringing offerings to the Pheroh Ptah-Hotep.